Spion Kop with tram attached 1953/54. That's me on the right with my nephew Paul holding the ball. 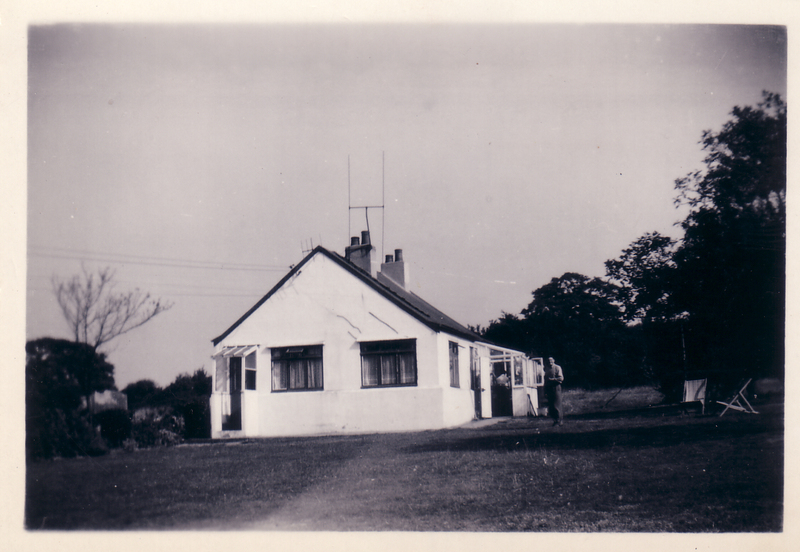 Living in a plotland bungalow was a bit like camping on a permanent basis. In fact, until I was 7 years old, I slept in a tram! In 1915, my Grandma Amy Burton was left a piece of land and wooden bungalow by James Burling in his will. 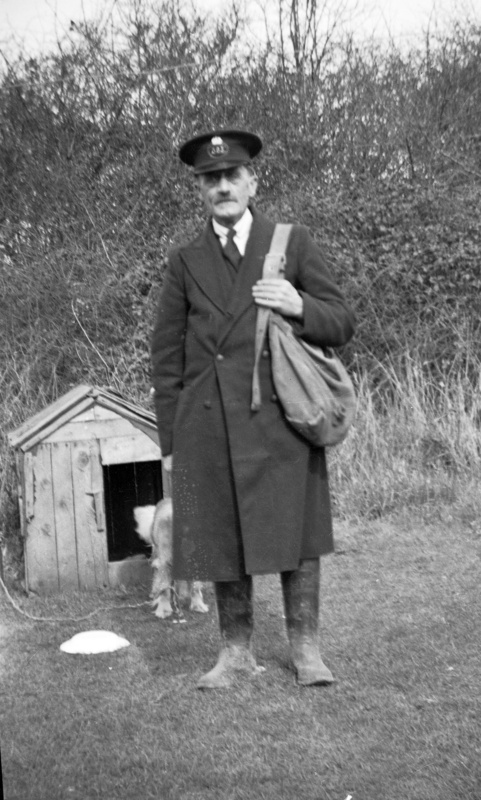 He had bought the property in 1907 from a Mr E Wood who had bought it in 1904 from Thomas Helmore the Estate Agent. The acre of ground was situated at the most northern part of Helmore’s Manor House Estate, not far from the A127, on the unmade part of King Edward Road (then known as Alexandra Road). The bungalow was originally called Honeysuckle Hall and the family used it as a weekend retreat. In 1920, Amy changed the name to Spion Kop, after the horse that won the 1920 Derby. My dad was Amy’s youngest son. 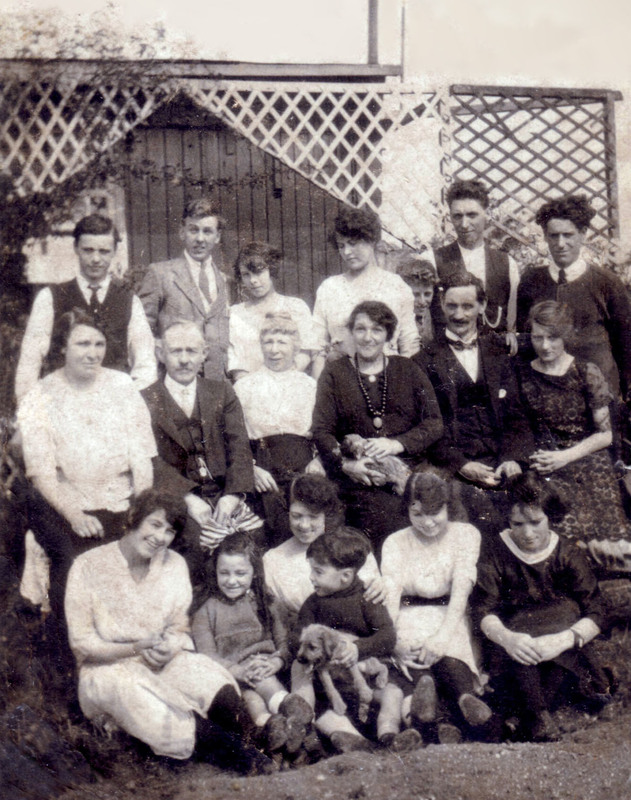 In the photo on the right, Amy is in the middle row, third from right. 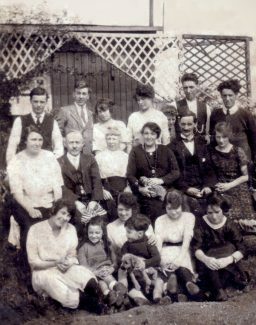 My dad, George is the little boy with curly hair in the back row, third from the right, peeping between his older brother and sister. 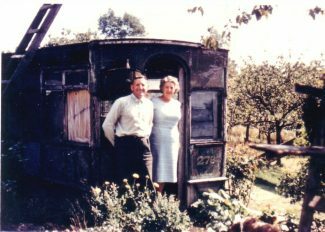 Somehow the family managed to bring a London Tram to Laindon, connected it to the bungalow and used it for extra sleeping quarters. It had been a horse drawn tram and the number 278 was clearly visible on the front. My dad told me many stories from around those times. Once an air balloon drifted across the garden with a rope dangling. My mischievous dad, tied it around a tree and a man in the basket waved his fist and shouted at him in French until my dad untied the rope and the balloon drifted away. 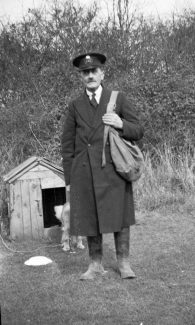 When he was about 14 in 1922, he and his best friend Jimmy Richards from Sunnymead, Richards’ Farm, went to Langdon Hills to watch the Hill Climb motor races. They climbed up a lamppost to get a better view and a photo was taken of them that appeared in the Standard. I would really love to see that photo but haven’t yet been able to trace it. 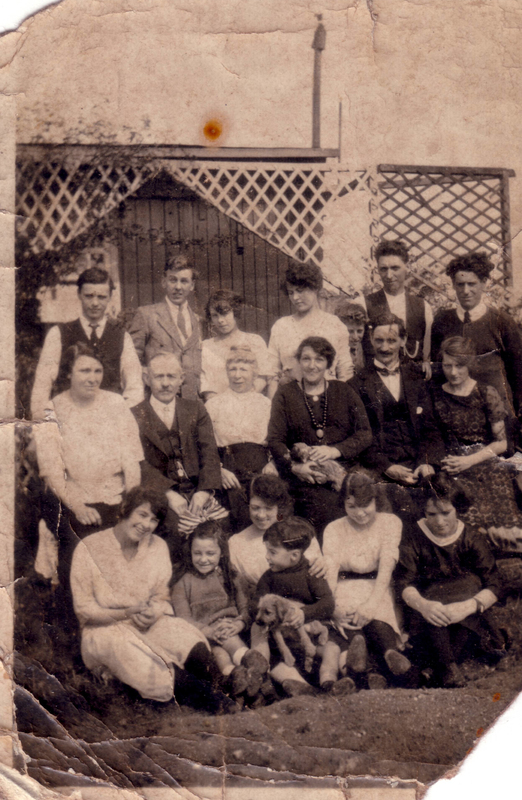 My dad, George married my mother Jessica in 1930, the daughter of close neighbours in Alexandra Road , Jessica and Henry Devine. The name of their bungalow was Pendennis. 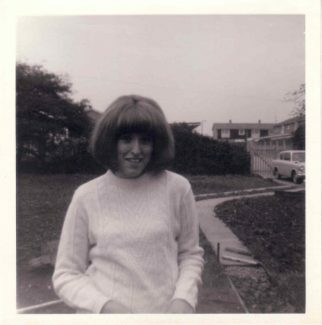 The newlyweds went to live at the Burton’s family home in Leytonstone/Stratford, but spent the weekends in Laindon. 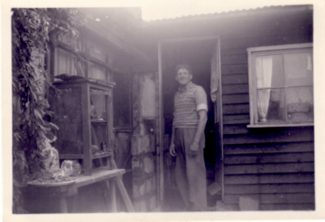 My Grandfather Henry Devine, worked as a Postman for 25 years until 1952, covering the Laindon and Langdon Hills area on foot in all weathers. When Amy Burton died in 1938, my mum and dad along with my older brother Dennis, decided to move to Laindon and make Spion Kop their permanent home. 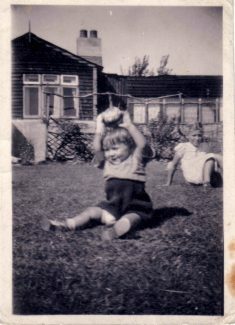 My sister Anne was born in 1939, I was born in 1946 and my younger brother Alan, in 1951. I can just about remember sleeping in the tram, which was boarded with wooden slats to blend in with the bungalow. It was divided inside by a Chinese screen with my sister’s bed one side and my bed on the other. We had no amenities at all and were almost self-sufficient. Water was kept in tanks just outside the kitchen. Coal and wood fires provided the heating. Calor gas provided the lighting and mum cooked on what she called a kitchener stove. A large butler sink provided the washing facilities and the toilet was an Elsan in an outside privy. A tin bath was used in one of the bedrooms, when an extra kettle of hot water was poured in towards the end to warm it up. 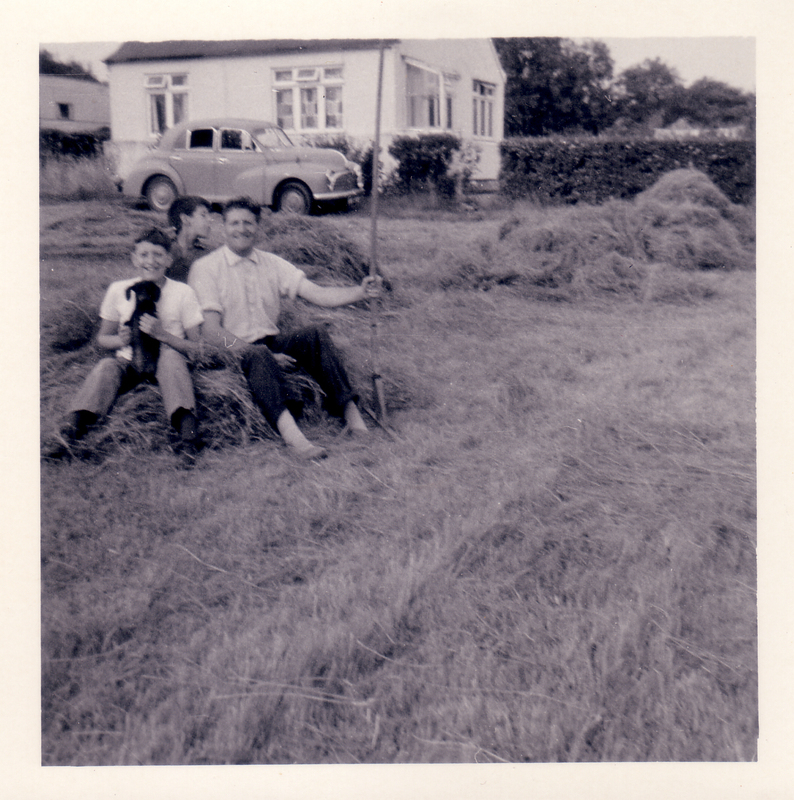 During the war years, my dad turned the acre of ground into a smallholding. We kept chickens, ducks, goats and a pig. 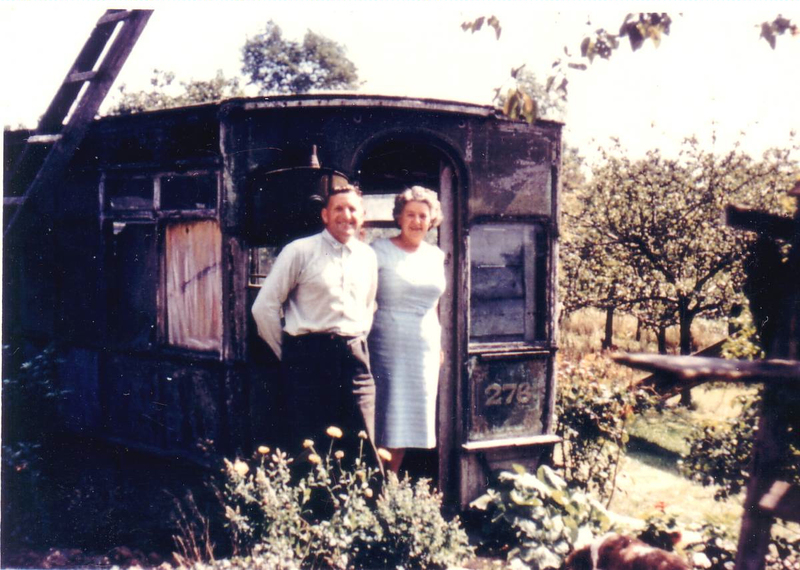 He dug an enormous vegetable patch which he tended with care and the garden had dozens of fruit trees and bushes. Alongside was another piece of ground which we knew as Cooper’s field. 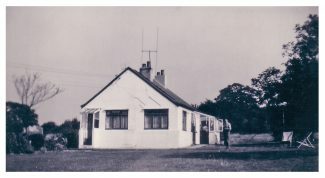 A derelict bungalow called The Retreat stood there which was once owned by Fred and Emma Cooper. My dad used to tell me a sad story about their only daughter, who once convinced her parents that while walking across the fields, she saw an aircraft land, the pilot got out, instantly fell in love with her and proposed, saying he would return for her. A wedding dress was bought, but the pilot didn’t return. I’m convinced it was a figment of the lonely girl’s imagination. Unfortunately, she died from a burst appendix in 1931 aged 30. Dad looked after Cooper’s field for many years; we tethered our goats there and cut the grass for hay each August. With help, my Dad dug a well around 1950. Before it could be lined, I was lowered into the well in a bucket to scoop up a puddle of water that was at the bottom – I didn’t mind at all. A tank was placed in the loft, a pump installed and finally we had running water in the kitchen. This served us well until we were connected to the mains in the sixties. Dad started to rebuild and restyle the bungalow single handed around 1952/53 when the tram was pulled away and I was able to use it as a playroom.In 1954, we bought our first TV set from Squires in Laindon High Road. A petrol driven electricity generator kept in an old Anderson shelter provided the power. We knew when the petrol was getting low because the picture would start to roll. We were connected to the main electricity supply in 1957. I remember the plugs being dark brown, round with an up down switch in the middle. A trip box was fitted in the kitchen that cut off our supply if we used too many appliances. We would have to unplug one and push the handle up to restore power. I found the light from the electricity rather harsh after the soft light given off by the gas mantles. The unmade road, known as ‘The Boards’ was lovely in summer in fact Alexandra Road was a beautiful country lane which I adored. However, not so in winter when it became a muddy swamp. It was unlit and very dark, something I became used to and knew every inch of my way home, however I was always relieved when the lighter evenings arrived in spring. When Bourne Close was built close to the western boundary of our garden, we were able to open the hedge and create an exit through the garages, therefore never having to walk the boards again. However, it was the beginning of the end for our plotland life, because Fords built close to our eastern boundary and we became quite hemmed in. My parents were heartbroken when they received a compulsory purchase order in 1973, although it wasn’t entirely unexpected. After some disappointing negotiations with the BDC, they moved out in April 1975. Unfortunately, the tram was left behind and I have some regrets that my dad didn’t get around to offering it to a museum for preservation. My childhood home was always in my mind, but I hadn’t ever been back there until Deanna Walker took me there in October 2009. After 34 years, I was at first a little disorientated, but got my bearings when we found the Oak Tree that my sister and I had climbed many times. An account of that occasion is included in her book “A Portrait of Basildon Plotlands – The Enduring Spirit”. My family history along with many others is now recorded in print, something I would never have imagined happening until I met Deanna. I will be forever grateful to her. I made some enquiries at Basildon Council and their Tree Officer informed me that the tree had been removed because the roots system was causing subsidence in a nearby property. The occupier’s insurance company had approached the Council with evidence of the problem; therefore, the Council had no option but to arrange for the tree to be felled. When I explained that the tree had been featured in a book about the plotland dwellings in Laindon the Tree Officer offered to replant with a different species, a nice idea but knowing how young trees are frequently killed by poor grass cutting practice or by vandals it would be unlikely to survive long enough to feature in the next generation’s memoirs. To lose a tree which has been part of your childhood is like losing a special friend. However, the Oak Tree was just one of many special trees that were removed when Bourne Close was built. Thank goodness for photographs. A sad story that shows that the great strength of the Old English Oak, cannot match that of the modern day Insurance Industry. However, nothing can ever compare with the strength of our memories and the enduring spirit of plotland life in Laindon. To one who had known this tree from a proud, young oak, it feels like the murder of a dear old friend. When I visited it last year with Nina after more than 35 years and gave it a hug, little did I know I was really saying goodbye to the last vestige of my childhood. In my imagination, it still stands, as does Spion Kop, its gardens, orchard, pond and all the surrounding fields. 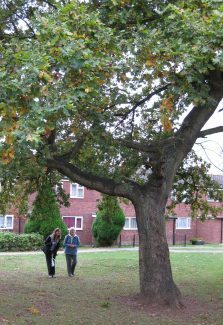 The Oak tree may end up having the last laugh as it is unlikely that with the pile foundations of the near by property it would have caused problems within the life expectancy of the property. But if they are correct cutting down the tree in one operations is likely to cause more problems due to heave, which occurs when a long established tree is removed in one operation. Nina Earlier today 13/6/11 I noted that the oak tree has been cut down. I do not know exactly when it was cut down but it does not look as though it has been down that long.